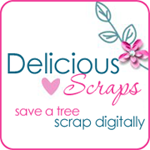 Delicious Scraps: Free Scrap Kit "Charming X-Mas" Pt 13 and an Award!! Free Scrap Kit "Charming X-Mas" Pt 13 and an Award!! Another Add-On to my Charming X-Mas! And I also got an award!! Thank you all who have given me awards!! I know I am a bit behind with posting them so please bear with me!! THANK YOU to all those who have left me nice comments!! They are greatly appreciated!!! You give me the inspiration to continue creating! Thanks for the new installment of Charming Christmas... glad you've decided not to call it quits with this wonderful kit! Thanks so much for another cute installment! This is very cute, thank you!! Thank again for your lovly Charming Christmas.. Thank you so much for continuing with this wonderful kit! where do you get all this inspiration from??? Thanks so much for the wonderful freebies!! hi, thanks for sharing this lovely x-mas kit. I looked all over the place to leave you a thank you for all those weeks now. I hope i'll found it now. Keep up the goodwork hun. Great elements :) Thank you very much for sharin! thank you so much for another lovely part to the kit. Thank you very much for sharing another part to this beautiful kit! Thank you so much for the add-on to Charming Christmas. I am totally charmed today that you would share more of this beautiful kit with us. Thank you so much and leaving you some love. Congrats on your award!!! You deserve it!!! Your kits are truly, truly delicious and I am so grateful to receive them. Thank you, it's lovely. Bye and merci beaucoup. I love the Charming Xmas series - so cute, thanks for sharing! OMG, this kit is absolutely gorgeous, the most adorable I ever see, thanks a lot for all those parts, they are so beautiful! I absolutely love those frames - thanks! Thank you again for your lovely freebie. Very Cute!!! thank you very much. No one deserves that award more! Thank you so much! So sweet and charming. Thank you! What an adorable kit! Thank you SO much for sharing ~ I grabbed all of the pieces I could find.